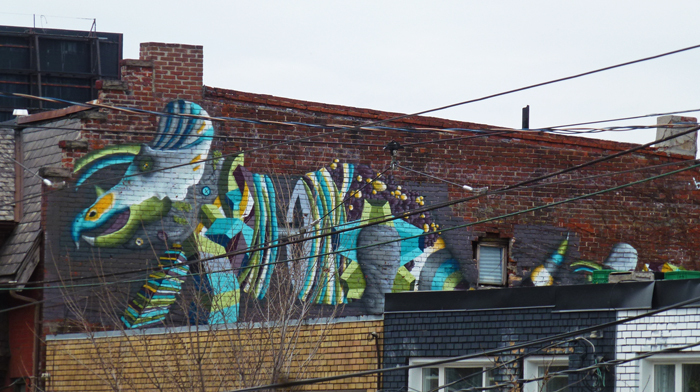 I was walking along Queen St W in Parkdale and spotted part of this mural by Birdo painted high above the rooftops of antique stores in the area. I climbed up onto some stairs to get more of it into view but I think you need to be on the roof or in a high rise to see it all. Birdo's creatures are always so colourful and abstract. You can see more by clicking on the label below. Taking part in Monday's Murals. Click HERE to see more creatures from around the world. It is a colorful dinosaur. Great mural. Enjoy your Monday and new week ahead. Very interesting! Have a wonderful week! Rooftops are in these days. I like it! To me it looks like a robotic dinosaur. Very pretty colors. You were lucky to spot it Pat. It's a very colourful dinosaur. Thanks for taking part in Monday Murals. ...I often wish that I had a ladder with me when I'm out taking pictures. You have shown us some of Birdo's work before. Always good to see his abstract murals. That is great fun. It's a strange looking dinosaur, what with a missing stomach and one weird eye or nostril down near its jaw. And Sharon is right - it does have a somewhat robotic feel to it. Birdo is a fine artist. Very colorful, must be nice to have it in view! Toronto is becoming a city that is rich in mural art. Cool! SOmething like that would be so fun in a kids room. A very colorful dinosaur. It looks less scary in these colors.